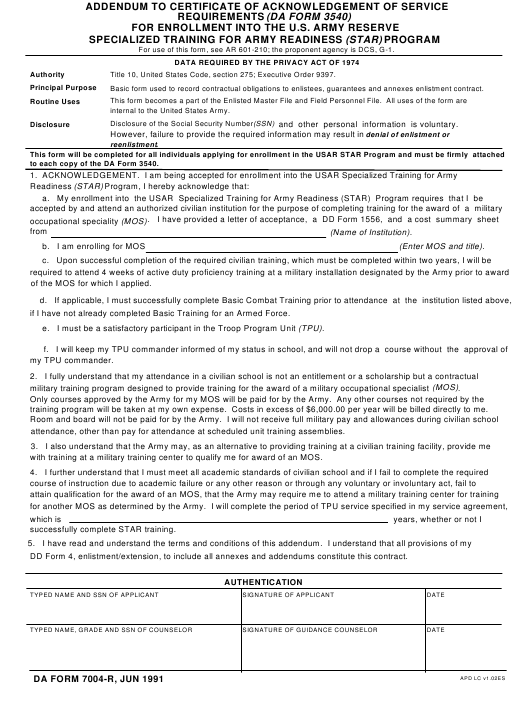 DA Form 7004-r or the "Addendum To Certificate Of Acknowledgement Of Service Requirements (da Form 3540) For Enrollment Into Us Army Reserve Specialized Training For Army Readiness (star) Program" is a Department of the Army-issued form used by and within the United States Military. The form - often incorrectly referred to as the DD form 7004-r - was last revised on June 1, 1991. Download an up-to-date fillable DA Form 7004-r down below in PDF-format or look it up on the Army Publishing Directorate website. Title 10, United States Code, section 275; Executive Order 9397. Basic form used to record contractual obligations to enlistees, guarantees and annexes enlistment contract. internal to the United States Army. and other personal information is voluntary. to each copy of the DA Form 3540.
of the MOS for which I applied. if I have not already completed Basic Training for an Armed Force. e. I must be a satisfactory participant in the Troop Program Unit (TPU). training program will be taken at my own expense. Costs in excess of $6,000.00 per year will be billed directly to me. attendance, other than pay for attendance at scheduled unit training assemblies. with training at a military training center to qualify me for award of an MOS. DD Form 4, enlistment/extension, to include all annexes and addendums constitute this contract.